Shower of Roses: 32 Weeks and 4 days. . .
. . . or is it really 33 Weeks and 4 days?!?! 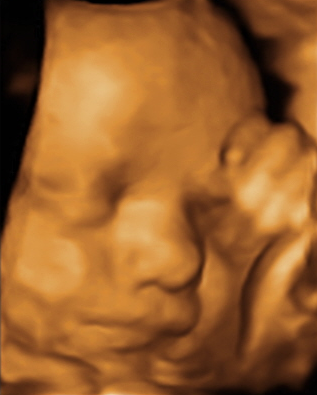 I was blessed with another peek at our little guy this morning, when I went back in for an echocardiogram, as well as to check his weight and positioning. Before I left for the appointment I told my husband that I was nearly positive that he wasn't breech anymore, just by the way I was feeling and all the extra room I now seem to have, and sure enough he has finally settled head down. Yay!! and we can hardly wait to meet him! When you posted photos a few weeks ago, I thought he looked like Snuggles, but in these, he looks like Rose! Good to hear he's in the right position. It's always worrisome when the baby decides to hang out sideways or right side up. 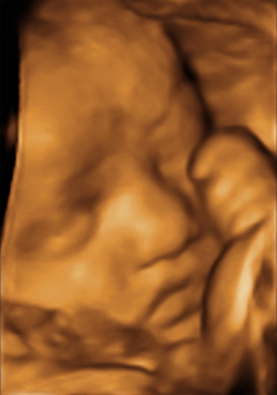 He looks like quite the cutie in these ultrasound photos. I think he loooks like Snuggles......how cute he already is. Just take it easy and this year, don't move furniture around...smile. God Bless! Oh wow! My first thought when I saw the picture was that you made a mold of Snuggles! So very precious! You must be feeling great!